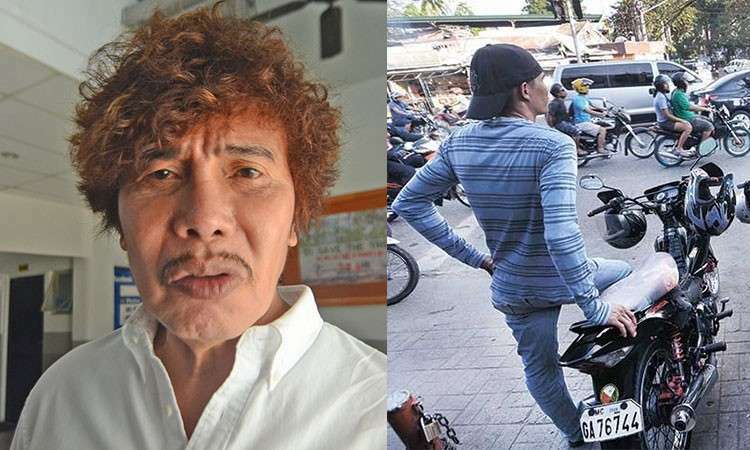 * The hair color of businessman Ruben Feliciano whom the Reluyas suspect of master-minding the January 22 ambush on their van that killed the San Fernando mayor's husband and two others. In his visit to the provincial police office Monday (February 4), Feliciano's crown of orange hair distracted a bit the attention of reporters listening to his denials. House Bill #8959, which the House of Representatives passed on third reading Monday (February 4), was a substitute bill that combined five versions. Thus, the authors numbered 24 lawmakers, including three from Cebu: Representatives Raul del Mar of Cebu City north, Ramon "Red" Durano VI of Cebu's fifth district; and Rodrigo Abellanosa of Cebu City south. House Speaker Gloria Macapagal-Arroyo is among the authors, which partly explains the speedy approval. The major reason, of course, being the scramble for votes of motorcycle drivers and their families by House reelectionists in urban centers such as Metro Manila and Cebu. * The words "Angkas" and "habal-habal" are not found in the bill that seeks to amend the Land Transportation Code. No reason therefore for anyone to complain about the bill favoring, or excluding, Angkas. The Constitution's equal protection clause apparently prompted the non-labeling of the vehicles the bill would legalize and regulate. The bill calls itself "Motorcycles for Hire Act." * Not all motorcycles may qualify. The motorcycle, which has to be registered with LTO as a "for-hire" vehicle, must have a minimum displacement of 125 cubic cms. and must be "backbone-type"-built. It has to be roadworthy, which will be "ensured" by LTO before registration or renewal of registration. It has to have a certificate of public convenience or special permit from LTFRB to operate in the business of transporting goods and passengers. * Not all drivers can drive a motorcycle for hire. They must go through theoretical and practical exams and undergo "continuous" safety training. A stiff requirement, unless LTO fails to do its job. * DOTr and LTFRB with other agencies whose work related with public safety are required to prescribe the guidelines on the operation of motorcycles for hire. Those include rules on public safety as well as fares, load of passengers or cargo and routes. * How about local governments that have been vocal about the issue? Under the bill, the government agencies tasked to prescribe the rules may coordinate with LGUs. Fines and other sanctions of LGUs may not be more than what existing laws prescribe. The bill went through the House third reading but the Senate, as usual, takes its time in reviewing the bill. The president might certify it urgent but that is deemed "highly unlikely." A shortcut of sorts is for the Senate to adopt the House bill en toto but still it only skips the bicameral meeting, not the required three readings. Senate reelectionists may not see the support of motorcycle for hire drivers and their families as crucial. Roliveth "Boyet" Cortes's death Sunday (February 3) struck down his chance of setting the record of three straight loss by a candidate in the race for governor. The 2019 bid would've been his third: he ran in 2013 and 2016 and lost to Governor Junjun Davide. The radio blocktimer died of a heart attack, obviously not set off by the controversy over the P1.3 billion building the Provincial Government proposes to build. The situation where the Cayetanos are exposed to be in during the Comelec hearing to cancel COCs of Alan Peter Cayetano and his wife Lani recalls the case of candidate for Talisay mayor some years ago. The candidate from Cebu City, who claimed he was a resident of Talisay, showed a small house where he was supposed to reside. "Kana? Mora man na og balay sa pati. (Looks like a dove house.)" In the Cayetanos' case, which also questions their residence, the complainant was amazed how three families of Cayetanos could live in one single-bedroom unit in Two Serendra in Fort Bonifacio in Taguig.